What is Variant and How to create variant? When you set the background job lets say Job Name: SAP_REORG_JOBS. Under ABAP program I am putting RSBTCDEL2 in Name but what will be the variant? Or how to create variant? I need to set several background jobs like SAP_REORG_SPOOL, SAP_REORG_BATCHINPUT etc. I have all background jobs name but don't know the variants. Please advise, I know it's a basic question but I have not worked on it yet. We can schedule job in background using SM36 Transaction code. We give job name and define job class then show status that job is schedule..
don't need to schedule the jobs manually. Just go to SM36 and click on Default scheduling. All the standard jobs will be configured automatically. type the program name and then go for option create variant. this way u will be able to see the list of variants u have created for a particular pgm in SM36 screen. variant is created when we are on the output screen..tha is after pressing f8...we fill all the selection parameters and then we do not have to execute the program...insted select GOTO options then VARIANT...and then give a variant name..and then save it...once it saved variant is saved...and u can run program with saved variant. Why we create a background job what is the need of this. 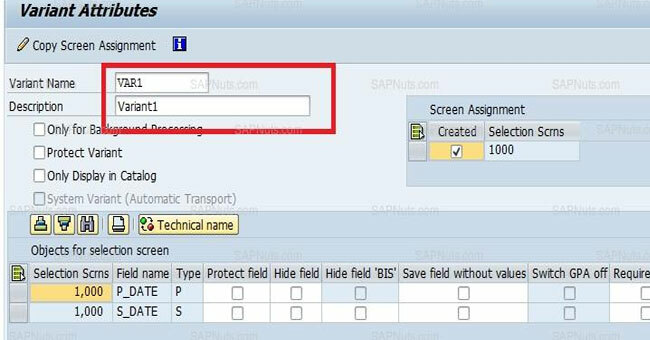 I am a newbie in sap abap so help me out with this.